The second workshop of the 2016 series, Assessing Opportunities and Value Propoistions, was held on Tuesday, February 16th from 5:30-7:30p.m. in the Makerspace, Falmouth 102 on North Campus. Holly Butler, Director of the DifferenceMaker program introduced guest speaker Tom O’Donnell, Director of the Innovation Hub. Approximately 30 students attended the event. During the workshop, students enjoyed pizza and soda while working on an interactive activity to explore the opportunities associated with their projects and each project’s value proposition. Also in attendance were two DifferenceMaker faculty fellows, Deb Finch from the Manning School of Business and Stephen Johnston from the Francis College of Engineering. 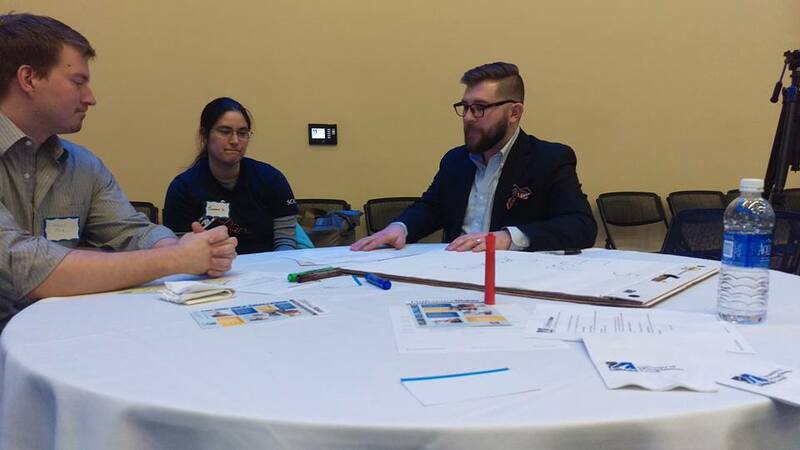 Tom O’Donnell wrapped up the workshop but showcasing two prototypes developed from ideas and pulled the workshop together by emphasizing the importance of knowing a project’s opportunity and what value that project brings to potential customers. The workshop materials will be on our resource page within the next few days. Feel free to review these materials if you could not attend or need a refresher! Please attend our last two workshops next week! All workshops will be held from 5:30-7:30p.m., in the Makerspace, Falmouth 102 on North Campus. Pizza and soda will be served! 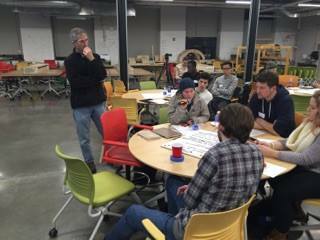 Our first workshop of the semester was held on Thursday, February 11, in the Makerspace located in Falmouth Hall 102, on North Campus! 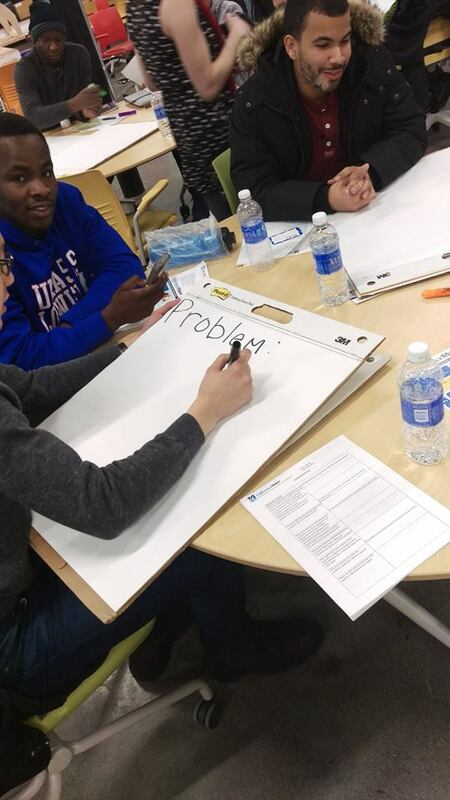 During the workshop students collaborated to identify the problems that they are interested in solving. Guest speaker Nancy Saucier, Director of New Venture Development, spoke about the process of identifying the roots of the problems being solved. Students worked together to dig deeper into their potential problems and develop a greater understanding of what exactly it is that they are trying to solve with their DifferenceMaker projects. Students participated in an activity where they were able to brainstorm and discuss their ideas with each other. Don’t forget to join us for the rest of our Workshop Series! All workshops will be held from 5:30-7:30p.m., in the Makerspace, Falmouth 102 on North Campus. 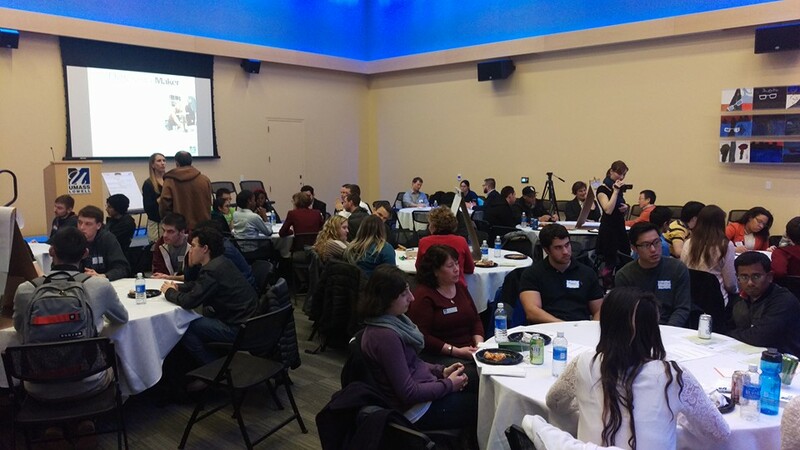 DifferenceMaker’s 2016 Idea Challenge Kick-off and Idea Hack was held on Thursday, January 28th in Moloney Hall at University Crossing. We were expecting around 50 guests and nearly 100 attended! This included students, faculty, and staff. The event turnout was amazing! Guests enjoyed refreshments while networking with other attendees from the six UMass Lowell colleges. Professor Steve Tello, Associate Vice Chancellor for Entrepreneurship and Economic Development and Chancellor Jacqueline Moloney kicked off the evening by introducing the DifferenceMaker Program, as well as the 2016 4th Annual $35K Idea Challenge. Following the introduction, Holly Butler, Entrepreneurial Initiative Project Director, interviewed a panel of real-life DifferenceMaker teams. The two teams that participated in the panel were Playable Therapy, represented by Mark McGrotty and Hannah St. George and Zhuum, represented by Andy Lau and Darin Eidens. Attendees also had an opportunity to ask the student panel their own questions. Next, guests broke off into groups that were formed on problems they wanted to solve. At the beginning of the event, each student wrote down a problem they wanted to solve . These problems were then categorized into similar groups. These groups focused on specific areas such as education, innovative technologies, global warming and climate change, and more. In these groups, team members worked together to clearly identify problems. Then each group had the chance to pitch their problems. Next, students began to think about possible solutions to solve those problems. Most students stated that they wanted to apply to the Idea Challenge with these problems and ideas. 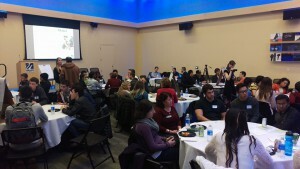 The Kick-off and Idea Hack was a wonderful event where creative minds worked together on real-world problems. Announcement: Please apply to the 2016 Idea Challenge by this Friday, February 5th!